I went to an exhibition of 80’s skate zines last night at NOG on Brick Lane. It was pretty cool to see all the drawings and random stuff by so many amazing skaters, artists and photographers. On display was LUMP magazine by Lance Mountain and Neil Blender, Ed Templeton’s various ‘zines, Skate Punk, work by The Gonz etc. 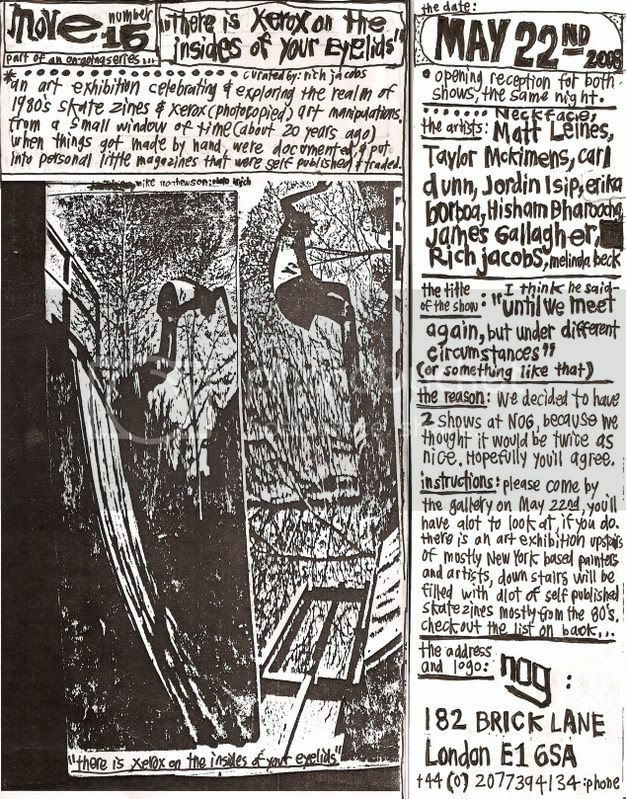 The heavily photocopied black and white collages looked great pasted on the walls accompanied by hand written notes about the ‘zines and skaters. There was also a collection of original artwork displayed upstairs with work by Neckface. I’ve always like this full on handmade stuff, like all the flyers for old punk shows and flyposters for vegan dinners at squats. There’s a great book I’d like to get my hands on, ‘Fucked Up and Photocopied’ which is crammed with so much cool artwork. sound like a great show…I’ve been collecting the stuff for years…I think art chantry tagged it best as “Instant Litter” I’ve got a bunch of great skate punk flyers on the site…most are not for sale but I leave them in the archive just so people can check’em out, use them for research, etc.